The Rhodesian Ridgeback is a dog breed that originated in Southern Africa. They are known for the “ridge” along their back, which is formed by a narrow strip of fur that grows in the opposite direction from the rest of their coat. They were bred for their tracking and baying of lions as well as leopards, baboons, and more. Although they were built for tracking down lions and keeping them at bay, they were not used for killing them. These dogs were valued hunting companions that could keep up all day with horse-mounted riders and then come home and protect the homestead from any intruder. Rhodesian Ridgebacks first showed up in the United States in the 1930s. The American Kennel Club recognized the Rhodesian Ridgeback in 1955 as part of the Hound Group. Now, Ridgebacks are still prized for their tracking abilities, but are also prized as family pets and companions who are cherished by their families. Rhodesian Ridgebacks are characterized by their affectionate, even-tempered nature and dignified, independent personality. They are loyal, faithful, and affectionate with their families. Due to their tracking history and hound status, Ridgebacks have a strong prey drive and a protective nature. They get along with children and other dogs, but may be naturally wary of strangers and may have an urge to chase other animals that come into their territory. The Rhodesian Ridgeback is a highly adaptable dog breed. They thrive in homes with securely fenced-in yards where they can run. But, they can also adapt to apartment living as long as they get enough exercise, mental stimulation, and attention. Due to their strong prey drive, they should only be let off-leash when they are in a securely enclosed area. They also do well in most climates. As with most dog breeds, they are sensitive to extreme heat and cold. Although they have an independent streak, they are devoted family companions and can be easily bored, so they do not like to be left alone for long periods of time. This is a generally healthy dog breed. As with any dog breed, there are some potential health conditions to be aware of. For Rhodesian Ridgebacks, potential health conditions can include hip dysplasia, elbow dysplasia, and some eye anomalies. Due to their barrel-chested frame, Ridgebacks can also be at risk for bloat. Talking to the breeder about the genetic history of the parents and asking to see related health clearances can help allay some of these potential health concerns. 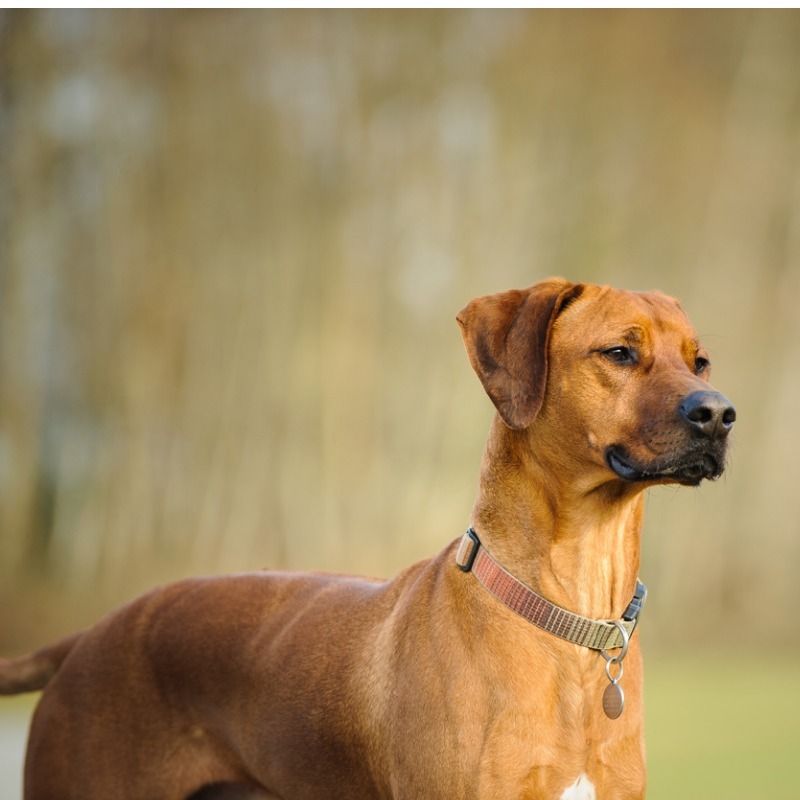 Although the Rhodesian Ridgeback is highly intelligent and picks up on things easily, they do not tend to be a good fit for novice dog owners. This dog breed has an independent nature and can be strong-willed. They can even sometimes comes across as domineering. Training a Ridgeback needs to be firm and fair, focused on using positive reinforcement, and starting in puppyhood and ongoing throughout their life. Early and ongoing socialization and puppy training classes can help ensure your Ridgeback grows into a well-adjusted, and also well-behaved, dog. This dog breed has a short wheaten-colored coat that can range from a pale flaxen color to a darker reddish-brown. Their nose is most commonly black, but has been known to show up in brown. This dog breed will shed moderately year-round and may show an increase in shedding twice a year as the seasons change. Overall, their coat grooming needs are minimal. Weekly brushing and the occasional bath are sufficient to keep a Ridgeback comfortable and looking their best. In addition to coat care, your Rhodesian Ridgeback will have other grooming needs like nail care, ear care, and dental care. Regular nail trimming is important to keep your dog’s nails from getting too long and causing your dog discomfort or issues with movement. Usually, monthly nail trimming is sufficient to keep nails from getting too long, but may need to be trimmed more often if they are not wearing down naturally. If you hear your dog’s nails clicking on the floor or if they are getting caught in things, it’s time for a trim. You can try starting off early with nail clippers, but if your Ridgeback is consistently resistant, you may have more success with a nail grinder. Ridgebacks have ears that flop over, which can be more prone to ear infections because they can trap moisture, dirt, and debris. So, it’s important to regularly check your dog’s ears and carefully clean them as needed. Making sure your dog’s ears are clean, dry, and free of debris can help prevent ear infections and they are not developing other issues like ear mites. When it comes to dental care for dogs, using an enzyme toothpaste or brushing their teeth every day is ideal. In addition to regular gum and tooth care, you can also supplement your efforts with dental hygiene chews or even a vet-approved dental care diet. This dog breed is built to be strong and is very athletic. 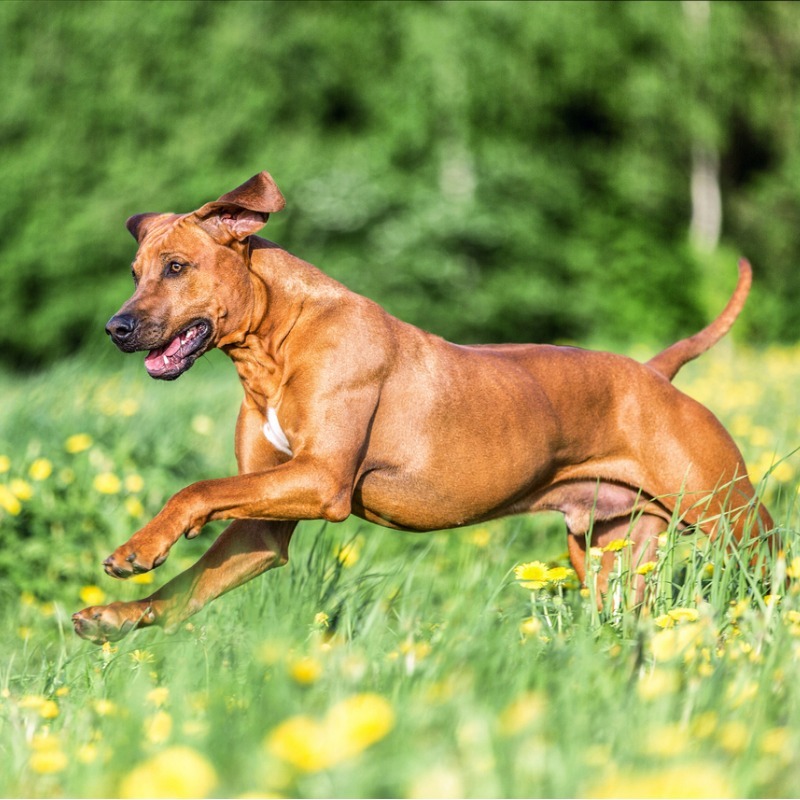 The history of this dog breed might point towards a high-energy dog, but a Ridgeback requires a moderate amount of exercise to be happy and healthy. However, this does not mean they are couch potatoes. Far from it, Rhodesian Ridgebacks need long walks, play sessions, and plenty of physical activity to stay happy. They also love to run. Running with you, going hiking with you, or even going for a swim are all great activities for this dog breed. Ridgebacks are also a good fit for dog sports, especially tracking and agility. A fully-grown Rhodesian Ridgeback usually stands 24 to 27 inches tall at the shoulder and weighs between 70 and 85 pounds. A Rhodesian Ridgeback generally lives for 10-12 years. Due to originally being bred for tracking and confounding lions during a big-game hunt, the Rhodesian Ridgeback was previously called an African Lion Hound.